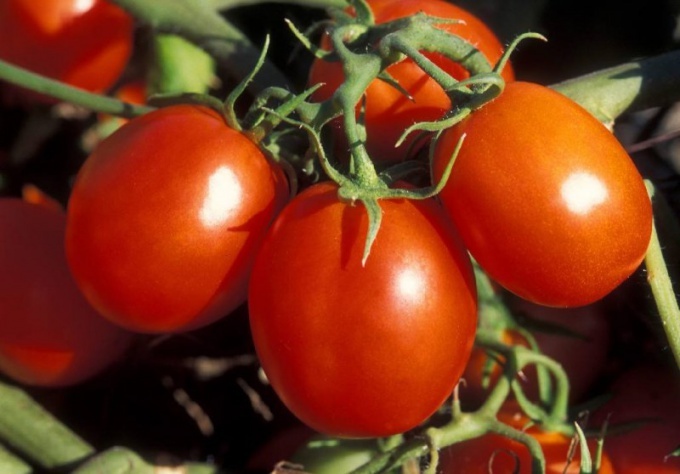 Tomatoes can be grown in open ground and closed. without film and greenhouse plant varieties that are best suited to this method of cultivation. Naturally, they should be unpretentious and cold regions and precocious. To grow tomatoes in open soil seedlings and nonseedlings way. Buy tomato seeds for outdoor growing. It is better to choose determinate varieties, these tomatoes Slavovitsa and nevybocovala. They even can not pasynkovat. This sort of "Sunny", "Moskvich", "Sanka", "far North", "Yamal", "oak", etc. For 55-65 days before the planned planting in the ground sow the seeds for seedlings. That is, until the time when the stop freeze in your area. For Central Russia it is approximately may. So you need to sow the seeds in March. Pour into seedling boxes a mixture of 7 parts peat, 1 part sod land and 0.5 parts of sawdust. Sow the seeds band method, pour. Cover the boxes with glass or plastic and put in a warm place. When the seeds germinate, move the crates to the window, clear glass. Water it, remove weeds. After the appearance of the second true leaf optinuity seedlings in a separate container. It is better to take peat pots. While picking presidnete the tip of the root. Care for seedlings, but when the threat of frost, plant in open ground. The ground for this time, prepare in advance. Dig, remove the roots of weeds, make a ridge. Plant tomatoes at a distance of 60 cm from each other by a tape method. Tie up to the pegs. Water and loosen soil. After 2 weeks spend hoeing the roots, so when watering the roots become bare. Remove the shoots as they appear. Swipe treatment from late blight. To do this, use Bordeaux mixture. Dilute it according to instructions and spray the leaves and stems. If you grow semi-determinant cultivars, and hybrids, such as "Cosmonaut Volkov", "Talalikhin", "swift F1", "Sturgeon", etc., be sure to match the two stem to get a lot of tomatoes and not useless foliage. For best resistance to lowering temperature temper seedlings before planting. To do this, take it daily for several hours in a cold room and then just leave for 2-3 days in open air.